Leaky Gut and Food Sensitivity - Oxford Biomedical Technologies, Inc.
You overheard someone talking about leaky gut and all the symptoms they were suffering because of it. You listened with great interest. It sounded like what you’ve been going through for some time – fatigue, brain fog, digestive problems, bloating, headaches, even aches and pains. You realize that almost every time you eat, you don’t feel well afterwards and you can’t figure out why. Sometimes the symptoms are mild, sometimes they’re severe, and it’s not always the same symptoms all the time. But something’s not right. Your doctor couldn’t figure it out. All the tests seemed normal. But why don’t you feel normal? You’re thinking it might be something you eat, but how can you know for sure? After all, it’s really hard to pinpoint which foods are to blame. Is it gluten? Is it dairy? Maybe it’s chemicals such as food additives, preservatives or colorings? Or maybe it’s a combination of foods and chemicals? There are more questions than answers. Leaky gut may be a big part of the problem. 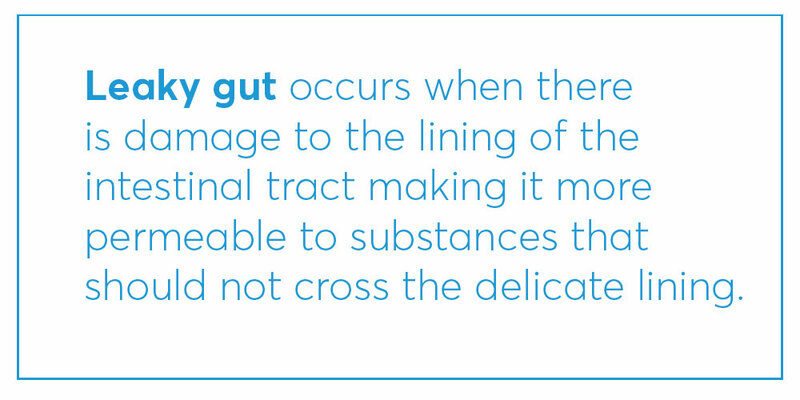 Leaky gut is something many people have but aren’t aware they have it. It’s silent. Leaky gut occurs when there is damage to the lining of the intestinal tract making it more permeable to substances that should not cross the delicate lining. Normally, only nutrients from fully digested foods such as vitamins, minerals, emulsified fats, amino acids and simple sugars are able to cross the intestinal barrier that separates our blood stream from our gut. But when the gut becomes leaky, undigested food particles, bacteria and toxins are able to make it through the gut lining and they enter the circulation, going to places in the body where they don’t belong. It’s like opening the front door of the house and allowing burglars to enter. The body’s defense system fights back and it’s during this fight that uncomfortable symptoms are experienced. There are several causes of leaky gut and one or more of these causes may be at work simultaneously. For example, leaky gut can be caused by damage from an autoimmune reaction, such as celiac disease which destroys the microvilli and increases permeability, or by the presence of gluten which causes the production of a chemical called zonulin which directly opens up the tight junctions, making the gut more permeable; it may also be due to damage caused by bacterial toxins in conditions such as Small Intestinal Bacterial Overgrowth (SIBO), which also contribute to gut inflammation leading to leakiness. And probably most importantly, leaky gut can be caused by undiagnosed food sensitivities with the immune battle between white blood cells and undigested food particles taking place in the villi of the small intestine. Food sensitivities are the main cause of symptoms associated with leaky gut. Food sensitivities create a vicious cycle in that they help maintain the reason for their development (the leaky gut) while being the direct cause of the various symptoms suffered. This vicious cycle can only end after carefully removing all sources of reactive foods and chemicals, which not only eliminates symptoms, but also allows the gut to finally heal. But this is easier said than done for a number of reasons: Food sensitivities are often dose-dependent, with symptom onset delayed by many hours, and there are usually many reactive foods, not just 1 or 2 as in food allergy. And just like each person has a unique fingerprint, both food sensitivity symptoms and trigger foods are different from one person to another. In other words, in two gluten sensitive people, gluten may cause digestive problems in one person and migraines in another. And in 10 migraine patients, there could be 10 different sets of trigger foods. Because of this, obviously there is no one-size-fits-all diet. To make matters even more challenging, that “healthy” salmon with all of those anti-inflammatory health benefits you read about and that you so desperately want for your own health, may actually be the cause of an inflammatory reaction that gives you diarrhea, fatigue or any symptom! The unexpected and unfortunate truth is that even so-called healthy foods like salmon, blueberries, garlic, or broccoli can become triggers that lead to unwanted symptoms. It’s a very challenging puzzle that requires an expert approach to figure it out. Although research proves that leaky gut exists, there is no perfect test to diagnose it, diagnose its cause, or determine if a particular therapy is effective at treating it. What is known is that diet and stress are two things that play a significant role in causing leaky gut. It’s also known that certain supplements can help decrease inflammation in the gut and help heal the lining of the gut. Therefore an individually prescribed diet, stress reduction and supplement plan are a big part of the solution. Monitoring symptom improvement is the best way to determine the effectiveness of therapy and the healing of your leaky gut. It quantifies the degree of the inflammatory response to a wide range of foods and chemicals, identifying your “reactive” foods. The best individually prescribed eating plan is LEAP under the guidance of a fully trained Certified LEAP Therapist or other practitioner experienced with the LEAP protocols. The reason is because no other approach is as easy to follow and no other approach decreases diet-induced inflammation as fast as LEAP. Find out if food sensitivities are a part of your lingering health problems. Where should I draw my blood and how do I send it? This page will clearly explain what you need to do.